Okay, let me set the record straight…as if you needed me to. God is most certainly NOT dead. However Black Sabbath has resurrected (no pun intended) their music career with Ozzy Osbourne lending his vocals once again to the band. This heavy metal/progressive rock band is known for their dark gloomy, foreboding songs and lyrics. So I guess in that context you shouldn’t e surprised to hear this song on their new album. I get the sense from this song though that Ozzy or the writer is searching for the right answers. You know we all sometimes regret the angst of our youth, and within this song there is a questioning of what is known. 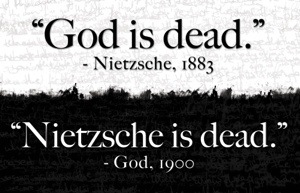 It’s been claimed many times since Nietzsche stated it ‘God is Dead’, and I believe it speaks more from the human rebellion (sin) inside of us than is truth. God is most certainly not dead, I don’t have to defend Him, He is alive and well and evident in this world through the wonders of nature and through our faith and compassion to others. Live it daily and don’t buy this lie!